Several times in recent weeks, I have been involved in conversations or meetings revolving around the idea of teacher evaluations and interruptions to teaching. Several times, the term, "...the teacher at the front of the classroom...," was used by numerous folks. The first time I heard it, my immediate and silent response was, "Where???" Each time I heard the term afterwards, my skin felt a little more itchy. The term bothered me more and more. When discussing evaluations, one of the participants stated, "When I walk into a classroom, I love seeing the teacher at the front of the classroom and all of the students watching attentively." I thought to myself, "If the teacher happens to be at the front of the room and the students are attentive that is a good thing, but if the teacher is not at the front of the room and the students are attentive to their own learning...even better!" 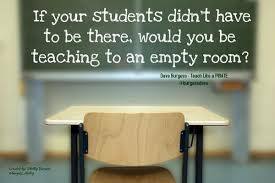 I wondered, "How often does that participant expect teachers to be at the front of the room?" If I noticed a teacher at the front of the classroom every single time I visited, I would be concerned with lesson design, student engagement, and differentiation. Another time, a small group was discussing classroom interruptions. One person stated, "If the phone rings and the teacher has to leave the front of the classroom to answer it, that can kill the flow of the lesson." I wondered, "How long can a lesson actually flow with a teacher at the front of the classroom?" I get it that a phone call can occasionally interrupt something that is going on, but in a highly engaging classroom, there is not much that actually interrupts students! Their desire to continue with their learning far exceeds the ring of the phone, and for sure, a teacher stepping away for a moment. Finally, I watched a webinar about student engagement. The presenter intended to share tools for keeping students engaged. She noted that in her classroom, she never sat down. She continued to move around the room as she spoke. She kept moving so the kids had to continually adjust their sitting position and turn their heads frequently to maintain visual contact with her. She claimed that her students were sitting quietly and engaged for 45 entire minutes because she kept moving! Itchy, itchy, itchy. I closed that webinar soon after. Sure, if you move a little kids will watch you move. They will maintain a bit more attention. For real engagement, design a lesson where the kids rarely stop moving! Design learning with several changes of state for students! Design an experience with differing levels of dialogue in different places in the room with differing groups of peers, based on a material the students choose and they actually care about, based on great questions! That is engagement. And you rarely even need to stand at the front of the room.